Apple’s new iPad air has come with a boom and is now exceeding expectations in sales. It has received a major boost in sales near launch. Relative to its previous iPads, the iPad air is selling extremely well. Although trial and error is part of product, some screens of the new Apple iPad air have been found to be faulty according to a report. The fault that is the colour deviation of some white content was earlier reported in the iPad 3 also. 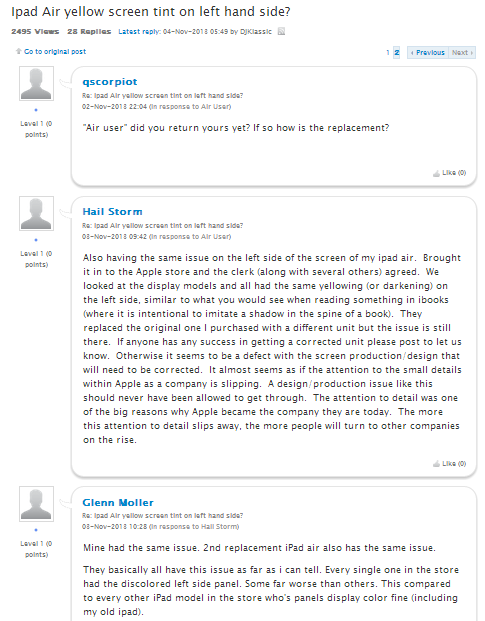 It is ironic to see that the display of the iPad air is being manufactured by Samsung because earlier, neither Sharp nor LG could meet Apple’s strict quality standards. As u can see from the picture above, some part of the screen which is supposed to be white is seen as slightly yellow.This issue is generally a hardware problem and will not solve itself or be rectified by resetting your iPad. Replacement is the only option in the long run. This is a thread created for the same issue a couple of days ago, the user reports that the problem is not fixed by resetting the device. The iPad is a worthy device to be crowned the king of tablets for now, Apple has a strong market share in the tablet region, this small problem should not stop u from buying it, although we hope apple will call the faulty units back and replace them.